Just a quick posting to link to my last posting on countryside writers. 3 transmissions, Good Friday and Easter Saturday at 15.30 and Easter Sunday at 14.45. Yesterday was a momentous day: I finally put down my editing mouse and said a sad farewell to an 8 month pilgrimage with one of the greatest prose writers of natural history England has ever seen, Edward Thomas. Of course I am talking rubbish, there is no way I can be on a pilgrimage with a man who died 47 years before I was born, but metaphorically I have been on my own long journey with this most eloquent of Countryside writers. Along the way, the road has been bumpy, the path slippy, and the destination seemed never to reach to me further than the horizon. That bumpy and slippery road is apt, as Edward Thomas had a lifetime's fascination with roads, paths and trackways gained from a years wandering The South Country as his 1909 book put it. But yesterday, my horizon came into view and the sun shone once again in the West. Making a radio programme on a writer who is adored and loved by many is a daunting prospect. It is also one of huge compromises. How can I possibly say anything new, or worse still, misrepresent the facts. Compromise is the name of the game, and yes, while my name will be there as Producer of this programme on Radio 4, to get to my destination many ideas which were exciting at the development stage never made it to the Grand Finale. The team which surrounded me needed to hold me steady, calm the nerves and generally just be there quietly doing what's needed to stop me going off the rails. Principle in this team was Matthew Oates of the National Trust, who is the programmes presenter. A chance encounter with him in July 2012 while on a butterfly day at Cherhill Down in Wiltshire allowed us to discuss an Edward Thomas programme idea, to celebrate the centenary of Edward Thomas's last piece of prose writing, In Pursuit of Spring, published in 1914. The year before, I failed to get commissioned an idea of mine to Radio 4 along the lines that 2013 could be seen as a momentous year for nature writing anniversaries. Some anniversaries were at best tenuous, but my idea for a 10 part 10 minute series which would whet the appetite of the listener by exploring a single point of time in the lives of some of the best nature writers we have ever seen; writers which to a new generation are mostly forgotten. Sadly my idea fell by the commissioning wayside, but I still have that ambition to do this. Here I'd like to share those writers with you now, as they still excite me, not least as I am staring at a 250 year span of English nature writers. Can any other Country boast so long a nature lineage? A sub plot of mine is that these writers were speaking to us from a different time, but their words echo along the timeline of history and are as fresh and as relevant to readers today as they were in their time. Thomas himself completing his cycle ride for In Pursuit of Spring over Easter 1913 laments the car traffic noise despoiling his rural idyll. Which asks the question, what would he think of today's traffic? But there is possibly a more serious point here. Those writers were recording a changing landscape, sometimes unwittingly through observations of the here and now which to today's readers is astonishing for its richness and variety of wildlife. But also, like another writer Thomas Hardy who predominately set his books in 1840's Dorset, they were often harking back to a landscape either of their own memory, or gleaned from family and friends observations. The truth lies where I wonder? We all forget over time as our little grey cells fail to replace themselves quickly enough, but the written word, remains fresh and permanent. There is another angle to this, something which Dr Sophie Lake an ecologist calls Generational Amnesia, whereby our baseline of how the countryside should look is being reset based on each generations experiences of how it looked as they experienced it for the first time. Today's child thinks cars and planes and the maelstrom of modern life is normal. 100 years ago, cars and planes were just beginning to breach the wall of silence in our countryside; therefore someone in their 80's in 1910 would possibly be horrified. The countryside however looks pretty much the same as it did on Thomas's ride in 1913. But for how much longer? Today many of those landscapes are under greater threat than ever before. We are a small island and our land surface area is small, too small really to support a State planned population of 70 million. Something has to give, and today that giving seems to be some of the most uninteresting landscapes in the English landscape, or so planners think. Or to paraphrase Wilde, To lose one landscape may be regarded as a misfortune; to lose another looks like carelessness. Thomas Hardy's Dorset is increasingly under threat from development and in Berkshire the famous "Watership Down" will possibly go the same way as Newbury expands. We cannot stop progress, I believe a lot of progress is for the better, people need to live somewhere. We use cars, travel and generally fill in the gaps between towns. But for me, I find it sad to think that when that view from Jefferies farmhouse has gone, it will be gone forever. In the future anyone who wishes to experience Jefferies mindset as he walked the few miles from Coate to Liddington, will only be able to dream of it through his writings. None of these landscapes are exceptional in terms of their beauty. Few hold rare species or possess a view to take our breath away. They are just one of the many thousands of gently rolling areas of countryside, fields and hedges brimming with the nature of a managed English agricultural landscape. But as a piece of history for our nature writing ancestors those little corners of forever England are precious, really precious. As such these landscapes should be looked after. Not preserved in aspic and left to rot in some "roses around the door" time long forgot, we must conserve at all costs way, but managed for today, used for whatever they need to be put to, but with the understand that those landscapes are as important as any ancient monument. Wordsworth wandered lonely as a cloud over the Lake District, would anyone suggest building 15,000 houses and a Shopping Mall on the slopes of Grasmere? Of course not! Coate is no different; it's just in Swindon, and that's all. I'll leave you with an image of Kilve Beach in Somerset. Thomas ended his journey here in 1913, Wordsworth, Llewellyn Powys, Virginia Woolf and many other writers and poets have been drawn to this "ghostly coastline" of Coleridges, from which his poem The Ancient Mariner drew inspiration. ﻿On the day I recorded my radio programme there, as the sun set, I think I saw the ghost of Thomas talking to that Mariner. I wonder what they said? Burbage news is the local (to me at weekends) community initiative. It's a great little paper packed with information and news from this remote part of South East Wiltshire. For a few months I've written a nature article to the paper version, but they have just published an on-line version and on pages 8-9 after calls for articles I helped out with a short story, unrelated to nature.... a ghostly who-done-it. Complex ending a few have not understood, but that's the point. I hope you like it. I've not written much on the blog recently mainly due to a big work project I'm working on for broadcast over Easter this year. In 1913 Edward Thomas the poet and writer cycled from London to the Quantocks in 'pursuit of spring'. Why he did this journey is complex. Was he escaping winter, was he escaping himself, was he on a spiritual journey? 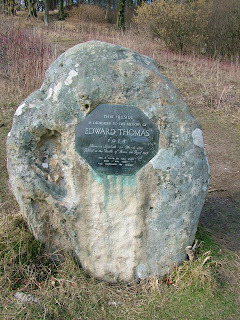 Over the last few months I've got to know Edward Thomas well. He was undoubtedly melancholic, but also one of the greatest observers of wildlife and nature in our literacy heritage, after another major nature writer, Richard Jefferies, who was himself an inspiration to Edward Thomas. I'll write more soon on this but our nature writing literacy heritage is being forgotten, I hope with this 3 part series to help re-balance this.